4. Cut the oranges into slices. 5. For the Vinaigrette: Take 12 of the macadamia nut halves and chop them and combine with the shallots and lemon juice in a small bowl. Whisk in the olive oil and season with salt and pepper. 6. Remove the fennel slices from the ice water and pat dry with towels. 7. 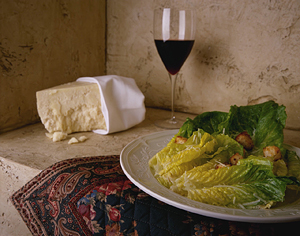 Place the mixed baby greens in a bowl and toss with the vinaigrette. 8. Place the fennel in a bowl and toss with the vinaigrette. 9. Put the fennel and oranges in with the greens add the macadamia halves on top. With a vegetable peeler cut slices of the cheese and garnish with 1 or 2 chervil springs per dish. I recently took a cruise to Reyjkavyk with Insigia and I fall in love with your fennel salad. The recipe you have here is not the one I ate, it has different ingredients. The one I am talking about has turmeric and is mixed with possibly celery. Could I get that recipe… Thanks ! 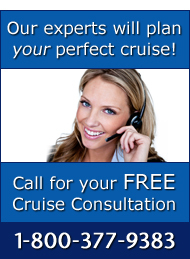 Thank you for your reaching out to the Cruise Web! I’m glad that you enjoyed the Fennel Salad on the Insignia. Isn’t their food incredible? We do not have that exact recipe you inquired about. However, I would love to help you plan your next cruise on Oceania so you may enjoy their food again. Do you have any future cruise plans on the horizon? If so, please reach out to me personally at 1-800-377-9383 ext 409 or at krisk@cruiseweb.com.